Beijing | Adventuring Towards . . . Nothing makes a place feel more like home than returning to it. I think I first said this, about Xiamen, after a 10 day trip to Taiwan in 2009. Returning to the Xiamen, seeing simplified characters, getting on my usual bus, knowing where my next meal was coming from – it was the first time this island felt like home. When I landed at Xiamen Gaoqi airport on Saturday, I thought of all the times I’ve returned to Xiamen. By my count, it’s something like three times in that airport, twice by train, once by bus, once by boat. Unlike the other times, I didn’t really know what to expect. Five years is a long time, especially in China. When I went to Taiwan for 10 days, I remember they remodeled Coco, my favorite milk tea place, and I almost didn’t recognize it. Especially after my time in Beijing was less than lovely, I had a lot of anxiety about coming back to Xiamen. Part of my post On Beijing and Loving China was an attempt to understand why I’ve loved China, remember why I loved Xiamen, and predict whether or not I would still love it. The two easiest changes to identify are the absence of my international friends, and the inevitable changes in myself over five years. During my time at XiaDa, I had very few (like 3?) American friends, but as my classmates were also studying Chinese, they were all international students. My best friends were Dutch, Spanish, Cape Verdean, Russian, Slovenian, Japanese, Filipino, Thai, Mexican, etc., and it was hard to imagine Xiamen without them. I ate most meals with them, went dancing with them, debriefed with them after strange or frustrating experiences. Our knowledge of the city was communal. I’ve since seen several of them, in their countries or in mine, and they were as delightful as I remembered, so it seems natural to question if they were what made Xiamen delightful. Then, in their absence? As for myself, the unhappiness I felt in Beijing worried me. Maybe I had lost my adventuring spirit, or my patience, or my sense of humor. China requires hefty supplies of all three. Was this Beijing that I didn’t like basically Xiamen, seen through loveless eyes? But now, five days later, I’m once again devastated to leave Xiamen, pained at the knowledge that I don’t know when I’ll be back, and struggling to express my feelings. There have been changes – There are two giant new buildings on the horizon, visible from any part of the island I go to. The air is worse, although the worst day I saw here would still be in the top 10% of my days in Beijing. There are a ton of tourists now – I think the opening of the new high-speed rail routes since I left has been huge for tourism here. This translates into crowded beaches, once the domain of us foreigners only, and significant traffic, of the kind I had only seen before on national holidays. There’s a Walmart on Zhongshan Lu, now, and a Carrefour, too, so you can buy Western goods without having to travel all the way to SM. Distances changed, too – not in reality, obviously, but in my memory. I went walking around 西村 and found our old malatang place and our old jiaozi place, but they were at least three times further than I remembered, and I almost gave up before we got to them. It was amazing that I was able to find so many things that I remembered, between the pace of development in China and my notoriously bad spatial memory. But for everything that was gone (Green Chairs Restaurant!! ), there were two that were still there (the malatang soup place, the hand pancake stand). I’m honestly not sure what surprised me more, when I found something exactly where I expected it, or when it wasn’t there. Both astonished me, every single time. But these changes are fairly superficial. The island is the same island I loved. Xiamen just can’t help being beautiful. People are always surprised when I say that Stanford is not the most beautiful campus I’ve lived on, but it’s true. Minutes from the beach at Baicheng, surrounded by mountains – In comparison with XiaDa, Stanford might as well be in the middle of Iowa. The most ridiculous thing is, Xiamen doesn’t seem to know it’s beautiful. Everyone always talks about Gulangyu, this smaller island nearby, but it’s so full of tourists I find it anything but peaceful. It’s okay, you can have Gulangyu, I’ll take Xiamen any day. Xiamen is a very clean city, and it seems like aesthetics were considered when building and developing it. I always feel stupid saying this, but one of my favorite things about the city are the highways – sleek and white instead of the usual dull gray concrete, and they light up at night along their edges. I could sit all evening on the beach at Baichang, watching the sunset first and then enjoying the winding illumination of the highways. Coming to Xiamen was good for my soul. The last few days in Beijing was honestly less a countdown to Xiamen and more a countdown to the next time I would see something beautiful. Counting generously, I would say the last time I saw something beautiful was at the Bird’s Nest, on July 18th – two weeks ago. Then there were those few clear days at the beginning of the month . 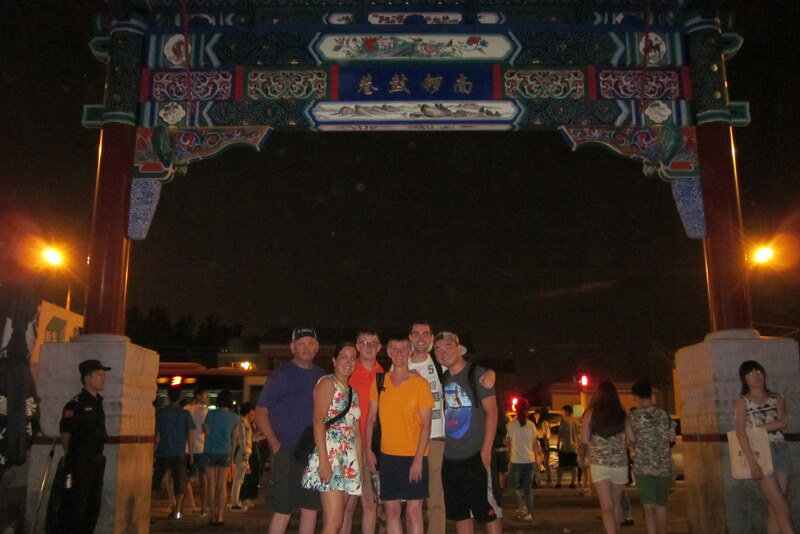 . . and then orientation, when we went to the Forbidden City and the Great Wall. Hmm, still have a few fingers left on this hand. So that first evening in Xiamen, as XuLei drove me along one of the bridges over Baicheng, I saw the sunset and cried. How was I so blessed to live here for a year? Questions like that ran through my head for most of my visit. What could I possibly have done to deserve this? Because it’s not just the island – it’s also the people. Oh, 厦门人，你们真的了不起. For all the time I spent with my international classmates, I was also pretty involved at church and did a lot of dancing, and in these circles my friends were mostly Chinese. To a person, everyone seemed as happy to see me as I was to see them, and they were so good to me. Chinese hospitality manifests itself in large part in “treating” (paying for things), which sometimes makes me uncomfortable because I don’t know how to respond, but I also appreciated the time people took (away from work, away from their families) to spend with me, and the way they welcomed me back into their lives for a few days after, for some of them, five years without contact. I made a few new friends, too. My host and good friend Xu Lei’s boyfriend/fiance; the labmate of a church friend who climbed Nanputuo with me; a Mexican woman I happened to sit next to at Chinese Mass who happened to be, like, my soul sister. And there were a few people I didn’t really remember from church, but they were really excited to see me (I made chocolate chip cookies that Christmas and handed them out at church, which I think did a lot to foster feelings of good will) and we talked more in these few days than in the whole year I was here. I saw Bishop Cai at Mass on my first day here, and talked to him afterwards. How have you been? he asked, Everyone is happy to see you. Thank you! I replied, it feels like coming home, I told him. Welcome home, he said. I went to Mass today at the North Cathedral – last Mass in Beijing. There was some activity going on, ton of young people in matching blue shirts, so I couldn’t sit where I usually do. But it’s always nice to see full churches. I think every time I’ve gone to Mass in Beijing, I see someone instructing someone else how to put their arms over the chest in order to receive a blessing at Communion. I wonder if Chinese Catholics bring a lot of non-Catholic friends to Mass? Afterwards, I went to a nice Xinjian restaurant at Xizhimen to have lunch with the two friends of a friend who took me to lunch when I first got here. Every single time I offer treat, I fret about not having enough money. Every single time. This time I had 450元. A lot of the dishes were around 150元, so I was legitimately worried. I even asked if they took credit cards, but they said only domestic cards worked. I tried to stay calm as we ordered, but they said what I suggested was too much and reduced it. We ended up getting a “big plate of chicken”, a plate of noodles, a few lamb sticks, some bread, eggplant and green beans, and Xinjiang [salty?!] milk tea. It was still a ton of food, and delicious, and cost 130元 (around $20). This also happens every single time I offer to treat – I can’t believe how cheap it was, and that I was ever worried. I got a ride back to the train station, which was great because it was HOT today. Only 35C, apparently, but it felt like the hottest day yet. I’m not sure if it was the humidity (only 50%! Xiamen will be 90+%!!) or the fact that the pollution was pretty bad and I wore a mask all day, but I could not handle it. The fourth ticket was the one I bought at Tsinghua and then lost. Unfortunately, they had no record of my ticket on the train number I had written down. I vaguely remember him saying that that train was sold out and offering me another one, but I don’t really know which one. We tried several others, all the fastest trains on that day (which better be what I bought!) but found nothing. I’ll probably make a trip back to the place where I bought the ticket, then, worst-case scenario, buy it again. It was 270元, or $45 – not nothing, but I’ve definitely made worse mistakes. After being on the go all morning in the crazy heat, I was ready to go back to the hotel for the rest of the day. I showered, cleaned up, took a nap, read The Three Body Problem, and kind of started packing. I’m trying to figure out what I can/should bring on my two weeks of travels, and what should stay in Beijing. Opening up my suitcases and going through my drawers, I got a look at the things I’d brought and never used. The award for Most Worthless Thing I Lugged Across the Pacific definitely goes to the big box of business cards I’d been told were ‘essential’. I think since I came to China, I’ve legimitately used one, and gave another two to labmates as basically a souvenir. The award for Thing I Almost Left Behind That I’m Glad I Didn’t is a tie between my Time Capsule (oh, the glories of wireless internet in my hotel room, at least when we have internet in the hotel) and my 3D printed brain (best. show-and-tell. ever.). All in all, I did a decent job packing. I biked to Beijing University today to have lunch with a Stanford student an an alumni. We’re connected through the DARE (Diversifying Academia, Recruiting Excellence) fellowship program. The guy was member of the 2nd cohort and has been a postdoc here for almost four years! The girl is in the 8th cohort with me and is here in Beijing for a conference. We had a nice lunch, sharing China experiences and talking a bit about DARE. It was a long, hot bike ride over there and back. We met at the southwest gate, which, as I work on the northeast side of Tsinghua, is all the way across both campuses, over 5k. In the evening, though, it was really comfortable. Biking to dinner was really enjoyable! As I worked after dinner, I saw the sun setting through the window. This is NOT a usual occurence here in Beijing. Here the sky is usually one shade of gray during the day, and the entire sky gradually dims to a darker shade of gray in the evening. It was strange to see pinks and oranges in the sky, and shadows on the ground. I couldn’t keep working. For over a week, I’d been thinking that I wasn’t going to see blue sky in Beijing anymore, and I just couldn’t miss this. I left work really early (7pm!!) and biked home, listening to Sarah Bareilles’ “Many the Miles”, my sunset anthem. A far cry from the evenings I used to watch the sun set on the beautiful beaches of Xiamen, but I’ll take what I can get. I also had to stop by the tailor to pick up my clothes. I had him fix up four articles of clothing – small things, like missing buttoms or torn seams. He was super friendly – no clothing problem is a problem, he said! – and he makes me want to go back there for more things. Maybe I will get another qipao? Today was a Bad China Day. I woke up and tried to take a shower before going to Mass, but we had only cold water. At the desk, they said a pipe had broken and they didn’t know when it would be fixed. What do I do then？I asked, and they shrugged. The subway seemed extra uncomfortable today. I hadn’t taken a shower because of the water situation, but what was everyone else’s excuse? It felt like it had been weeks since I had last breathed fresh air. I left at 8:40 and somehow got to the church at 9:30. Last week I left at 8:40 and had to take a taxi halfway to arrive on time. They say that doing the same thing twice and expecting different results is the definition of insanity, but in my experience, that’s just China. On the way back to the subway after Mass, a guy tried to sell me a turtle. This guy is always there on my way to and from Mass, carrying a giant turtle by a few strings. I asked him if it was a pet, and he said he was trying to sell it. Where did you get it, I asked. From the water. What would I do with it? Put it back in the water, he said. This sounds like a super easy way to make 3,000元, if you ask me. He also told me I could release it into the pool at my house, which I obviously have . . . I would have loved to buy the turtle, just to take it away from him. He stepped on it to show me, I don’t know, how strong it was? It looked very sad, half-dead really. I have to change subway lines at 西直门, where the Beijing North train station is. I also have to get the physical tickets for all the train tickets I’ve bought online, so I thought it would be convenient to do that today. Unfortunately, as soon as I swiped my card to leave the subway, I realized that I hadn’t brought my passport, and therefore wouldn’t be able to get my tickets. By the time I got back to Wudaokou, I needed to eat my feelings. A trip to Coco and Paris Baguette fixed that, and I went back to the hotel for the rest of the day. A nap, finally getting caught up on my Chinese book, and a little bit of work was just what I needed. In the evening, we had an EAPSI pizza party atthe hotel. We sat outside at the gazebo and just chatted for a few hours. I love these conversations, sharing funny stories and comparing observations and musing on cultural differences. We all talked about how different our experience has been from the guy who spoke to us at orientation. None of us have given talks at other universities, the only times people have left Beijing besides for research trips was one guy who spent the night somewhere while climbing. We all spent the first week preparing presentations for group meeting that we could have done ahead of time had we known. Sigh. It was discussion day again at English Aerospace Summer Camp. Today was somehow more difficult than the first day – they seem to have regressed? I guess the topics my coteacher chose were also a bit harder – nanomaterials, high speed rail, and 3D printing. These guys are rising sophomores and have really only taken introductory math and physics classes, so one challenge is that we’re teaching him both concepts and vocabulary. With my labmates, we can describe things like “isotropy” or “eigenvalue” in some rough combination of Chinese and English, and eventually we figure out the right English or Chinese word to go with the concept in our minds. But when homogeneity came up today during class, my coteacher and I kept trying to get them to connect this English word with the concept in their minds, only to realize that the concept wasn’t in their minds yet, so we had to put it there. We got the most class participation when talking about high speed rail. We asked them how they get home, and got a wide variety of answers, from a few hours on bullet trains to the guy from Xinjiang, who takes a 39-hour train to Urumqi and then another overnight train to his hometown. All of a sudden Jilin and Xiamen don’t seem so far away! In the afternoon, I started the computational part of my project. I use a commercial finite element software package called Abaqus which . . . I should probably explain what finite elements are. In mechanics, remember, we study how things react to forces acting on them. This is easy for a simple system like, say, a cantilevered beam with a point load. Think of a diving board, supported at one end with a person standing on the other end – there’s a simple equation that will tell you how much the board will deflect given the stiffness of the board and the wait of a person. For more complex systems – say, a plane flying through turbulence – there are no such easy equations. Instead, we “cut” the object in question into tiny pieces – finite elements, if you will, where “finite” means it is not infinitesimally small. This way, you end up with a bunch of simple shapes, like hexahedrons (cubes) or tetrahedrons (a shape with four triangular faces). Meshing – the practice of numerically cutting objects into appropriate pieces – is somewhat of an art. As you can see, if the pieces are too big, you’re not really modeling the object you want to model, but if the pieces are too small the system gets harder/slower/more expensive to calculate. In the picture above, #1 and #2 are too coarse, but depending on the application, any one of #3-6 could be appropriate. and were told to figure out what x, y, and z are. Except in finite element problems, we have several equations to solve for each element, and there may be hundreds of thousands of elements in a simulation. Thank goodness for computers, amiright? I use Abaqus, which is a [very expensive] commercial software package specially designed to solve problems like this. It’s got a nice friendly looking interface where you can essentially draw an object, mesh it, apply loads, and solve for deformation – to see how it will look after loading. For simple problems, that’s essentially all there is to it. My problems aren’t usually very simple, so there’s also some problem solving involved, figuring out a workaround so I can get the program to do what I want. Some people who do finite element analysis (FEA) write their own code, which gives you more control over the calculations, but then there are other demons to contend with. I do a little bit of both, using a feature of Abaqus called user subroutines; essentially I can write a little bit of code for one part of the calculations, and plug it into Abaqus’ own code. This is one way around the unfortunate fact that Abaqus does not natively handle materials that grow. Another way is to use thermal expansion instead – materials tend to expand as temperature rises, an effect that Abaqus does model – although this only works for very limited types of growth. Anyway, today I started working with Abaqus. I figured out that I have to use this thermal expansion workaround and with the help of my labmates got a linear perturbation buckle analysis running. Don’t worry, I won’t bore you with these details, but it is one of the things I had wanted to learn about here, so I’m happy about it. More exciting developments to come . . . I went to dinner with GuoYang and two other guys I haven’t interacted with much, and we talked about living situations on campus. I recently found out that two of my labmates are married, and tonight I found out that they don’t live together. “Of course!,” GuoYang said when I was surprised. Haha, nothing about that is “of course” in the US – at Stanford we have housing for singles, couples, and even families. One of the guys lives in an experimental mixed housing option, where Chinese and foreigners live together. This led me to ask why Chinese and foreigners are always separated – it seems like the powers that be are worried that we’ll corrupt the Chinese students. This was something that I found very frustrating when I was at XiaDa, because I was there to learn Chinese but contact with Chinese students was extremely limited – we had our own dorms, our own classroom buildings, our own cafeteria. On the best days, it’s a concrete jungle; on the worst, it’s an apocalyptic wasteland. There are many places in the world where you can’t drink the water, but this is the first place I’ve lived where you can’t breathe the air. If Xiamen was the beginning of The Lorax, this is the end. Those words seem a little extreme now. Perhaps still an accurate description of the city, but no longer an accurate description of my feelings about the city. A few blue sky days helped, as did whatever Paris Baguette did to make my stomach feel better. But also things like discovering the roof of our building, making actual progress on my project, finding a Coco on my way home from work, and the hundred small indications that my labmates are becoming friends. Beijing is still my least favorite place that I’ve lived in China, but honestly when you’re up against Xiamen and the farm, you have to be content with 3rd place. I’m looking forward to another few weeks here, and I know the goodbyes will be hard. The word for “hooligan”. I was telling GuoYang why I prefer WeChat over QQ, and I said it made my computer slow. He said those programs are called 流氓, or hooligan programs, because they install a bunch of other things without asking. The Chinese seem to have a high tolerance for these programs – I have all sorts of things floating around my phone’s home screen now because every app I downloaded wants to help me make my phone faster. Thanks but no thanks? You’re not supposed to put chopsticks directly on the table. Usually in the cafeteria, one person will get the chopsticks for everyone, and today I did it. I put them on the table, and when ZhaoYan came by with his food, he invented a pretext for going back up to the front so could grab a new bunch of chopsticks. This makes perfect sense, as people spit food out on the tables and they’re just wiped down with a rag occasionally, but I didn’t really think about it and besides, it’s sometimes hard to tell what kinds of uncleanliness are acceptable in different cultures, right? Like in the US we wear our shoes indoors, and in China there’s never soap outside of bathrooms. But, now I know!